I wanted to write to you about something I feel is important, especially in our world today. I would like to encourage you, as the bride, to make a speech at your wedding. Whether this is something you’d never dream of doing, or something you’ve been toying with, I want to share with you why I think there is no better time than now. Why am I, a groom and man, writing to you about brides’ speeches? A recent experience has made me believe that here at Bridebook, a wedding platform with access to 1 in 3 engaged couples, we have a duty to do the most we can to encourage growth, change and empowerment amongst our users. I recently attended my great friend Katie’s wedding. Katie has never liked being the centre of attention and surprised us all by making a speech. It was so heartfelt and meaningful, and left us all bursting with pride seeing her do it. (The pic I took of her is below). She is still gushing how happy she was she did it. It being her opportunity to say how much she loved her husband and her family, and a chance to say thank you. Most striking to me, though, was the effect it had on the other guests. The room was blown away by her speech. It also ignited discussion of why it is so rare to hear a bride’s speech? Many recently-married brides were incredibly frustrated for not giving a speech themselves. They had just “stuck to tradition”. Well, this tradition of only having the men give speeches at weddings is ready to be challenged by brides like you. Brides that have just as much to say and to express as the groom and the father of the bride. Brides that have just as much love to share and thanks to give. 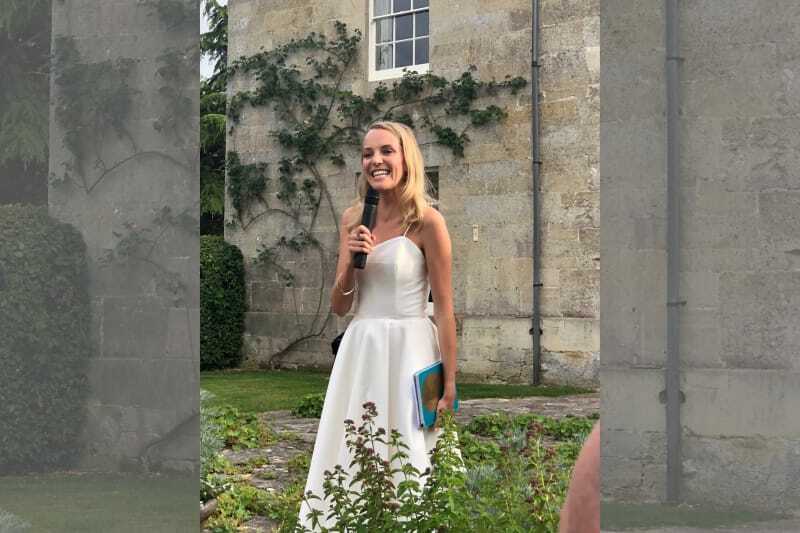 Please, think about breaking the mould and making a speech at your wedding. It doesn’t need to be long. It doesn’t need to be side-splittingly funny. It can just be a special moment of gratitude that you share with your closest friends and family. And you might just inspire and empower many people in the room to feel free to speak up in the future. Whether that is other brides-to-be in the room. Or your beautiful little flower girls in their futures. And this follows for all wedding traditions. You don’t have to feel entrapped by them, you can feel confident to select whichever appeal to you. If Meghan Markle can have a gospel choir singing Stand By Me in front of the Queen, you can do whatever you want : ) Whether that is making a speech, or being walked down the aisle by your mother, or something much bolder. Go for it! Your wedding is a just one big party celebrating you finding each other and falling in love, with all your nearest and dearest cheering you on for the future. Embrace it! So I would love you to make a speech. To be part of a great change to wedding tradition for the future. It has the potential to inspire, empower and make your guests and partner burst with pride. And I would love you to make the most of this once in a lifetime opportunity. If you are up for it – say so! Just add your name here so we can keep a tally of our change makers! Katie, the beautiful bride mid speech! Taken by Founder Hamish Shephard.